Members of Foundation Chapter No 5394 were honoured and delighted to welcome Anthony (Tony) Frank Hall Assistant to the Provincial Grand Principals and representing the Grand Superintendent, to their installation meeting to witness Mike Sincup being installed as the first principal for the ensuing year. Tony was in good company too, being accompanied by South Eastern Group Chairman David Durling and Gareth Jones group assistant chairman. Also attending were acting Provincial grand officers John Hindle and Ezra McGowan and various other Provincial grand officers and other companions. 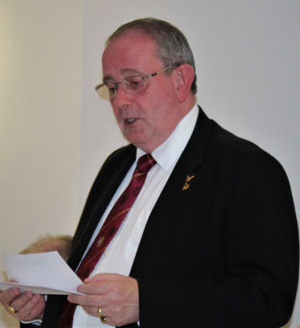 The convocation was opened by first principal Peter Stockton who quickly disposed of the ordinary business of the chapter followed by ballots for two joining members and then the appointment of installing officers into the second and third principals chair, these being David Holt and Chris Knowles respectively. 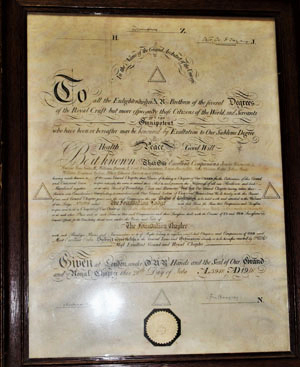 The third principal Darren Gregory, was obligated by Howard Carr and then the three principals and officers having been installed, there then followed excellent robe addresses presented by companions Norman Lowe to first principal Mike Sincup, Tim Burns to the second principal Howard Carr and by Ian Wood to the third principal Darren Gregory. On completion of the installation, Tony brought congratulations and good wishes from the Grand Superintendent Tony Harrison, wishing the three principals, their officers and companions in general, a happy and healthy year ahead. Tony Hall responds to his toast. Tony then on his own behalf, congratulated the three newly installed principals on attaining their chairs, the newly installed officers and likewise to the companions of Foundation Chapter in general on the excellent standard of the ceremony carried out throughout the evening. At the conclusion of the ceremony Steven was presented with cheques for the following sums, of £650 being made out in favour of the Masonic Charitable Foundation and £100 made out in favour of the Forget-Me-Not Trust. Tony responded to their presentations by thanking the chapter on behalf of the charities and on behalf of those who would ultimately benefit from the very kind generosity of the members of the Foundation Chapter. The convocation was then closed and was followed by a very friendly and jovial social board at which Tony, responding to his toast, commended the chapter on its buoyancy in taking in both two joining members and having two new exaltees waiting in the wings. He went on to extol the virtues of the Royal Arch and his hopes for its expansion and once more thanked the chapter for the generosity of its charitable donations, thus concluding a most enjoyable meeting. Pictured from left to right, are: John Hindle, Howard Carr, Tony Hall, Mike Sincup, Darren Gregory, Peter Stockton and Ezra McGowan.